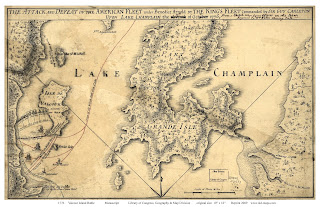 Nov 15 – Today I learned that these islands named for patriotic heroes (Ethan Allen and his brothers and the Green Mountain Boys who defended Vermont’s independence) were also part of a land grant to Allen and his brother. The earlier French explorers had named this island Grand Isle, but early Americans called them the Two Heroes. In 1798, Two Heroes was divided into North Hero (the entire north island), and the towns of Middle Hero and South Hero, the last two sharing the southern island and a representative to the legislature. In 1810, the town of Middle Hero was given complete autonomy and renamed Grand Isle. Vermont dairy farmers have used innovative round milking barns for more than a century. 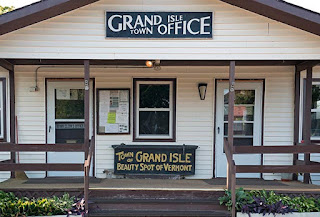 North of town, just off of US Route 2, is another example of Vermont practicality and respect for their history. 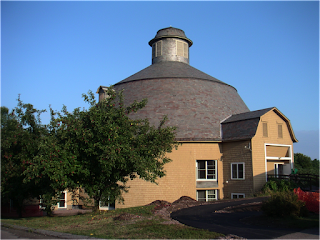 In 2005, this historic round barn was converted into apartments for low-income old folks. It offers 24 one- and two-bedroom rental apartments for seniors who want to live independently. Rents are based on household income, and rental assistance is available. I wonder how many of the residents were farmers, and whether they appreciate this juxtaposition. What a difference the lake weather makes in Google Street Views images! The weather on the lake is naturally very changeable, and the day the Google camera car drove through town was gloomy with dark clouds. Many flags were blown straight in the wind. At least the Adirondack chairs were not blown across the lawns of the inns. But the effect of this gloomy weather is to make the town appear less thriving than it may be in fact. Old postcards and recent photos show sunny summer festivities at the local inns. This general store (with an adjacent “Billiards” and “Air Hockey” room) looks abandoned with grass in its parking area. Maybe this effect is seasonal, too. Maybe this picture was taken in early spring before the tourist season began. There are about 2,000 people living in the township year-round. Because it’s the largest town on the islands, its businesses offer most of the practical services needed by all of the island residents, leaving the scenic shoreline to the leisurely vacationers. On a hill overlooking the western shore of Grand Isle is the Ferry Watch Inn. The house was built in 1790 with hand hewn timber and wooden pegged joints, using post and beam construction. The owner was Dr. Simeon Clark who was a paymaster for the US Army. During the War of 1812 British soldiers invaded this American outpost and searched the paymaster’s house for gold coins. Dr. Clark had previously buried the gold on the property for safekeeping. When the British soldiers were unable to find the gold, they took some geese and cooking utensils, and returned to their post on Valcour Island to the west (now New York). The historic farmhouse has become a pleasant inn filled with antiques. A barn space is available for parties or weddings, and guests who arrive in their own boats can use the boat moorage. 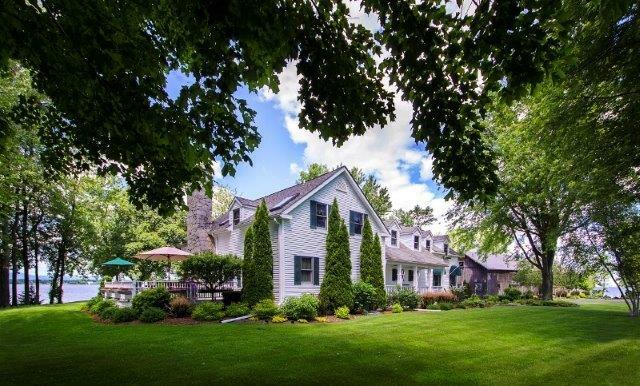 Guests can sit in Adirondack chairs on the sunset deck overlooking Lake Champlain and the Adirondack Mountains of New York. 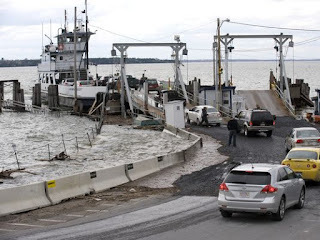 Below, the Lake Champlain Ferries cross between Grand Isle, Vermont, and Plattsburgh, New York. 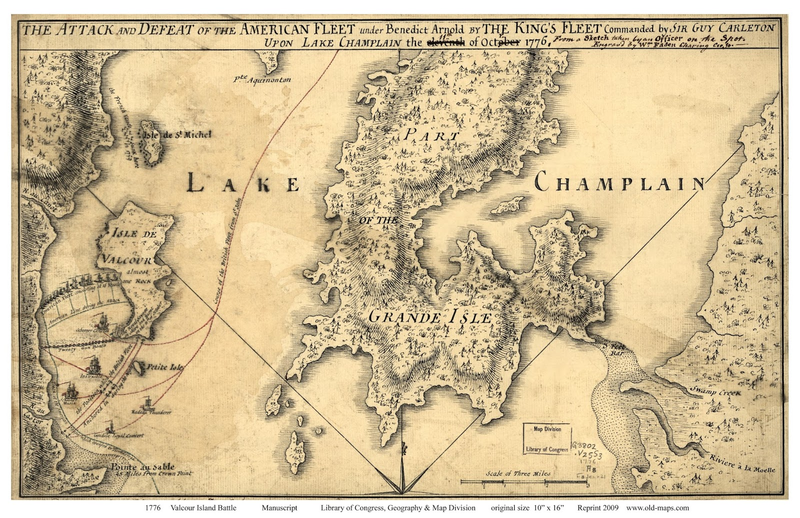 The ferry route between Grand Isle and Plattsburgh, NY, is the northernmost crossing on Lake Champlain. It takes only 15 minutes to get 2 miles from shore to shore. For travelers, this crossing is the most convenient way to connect Interstate 87 in New York to Interstate 89 in mainland Vermont. This ferry crossing is open 24 hours a day, 7 days a week, year round, but departure times vary due to wind conditions on the lake. My own route takes me (virtually) around the rest of the loop back to Highway 2 and southeast toward Burlington.